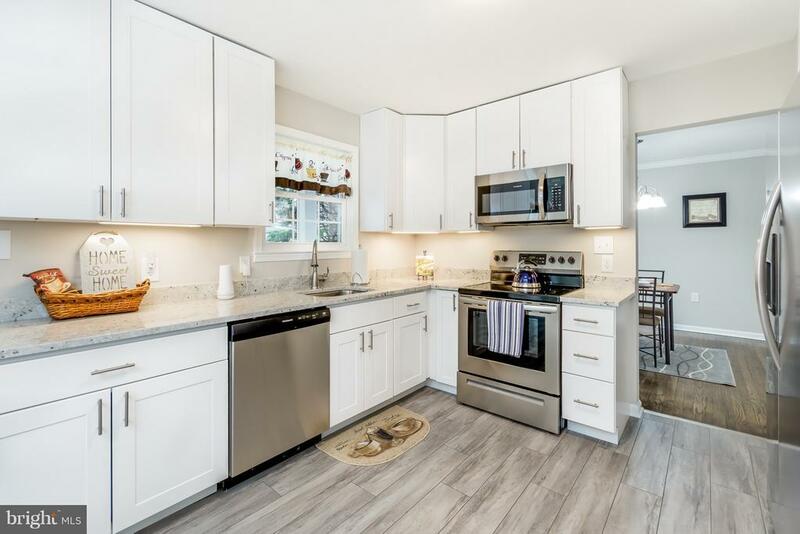 Beautifully renovated single-family detached home in Baltimore County with warm hardwood floors, vinyl-clad windows, a spacious eat-in kitchen, finished basement, and 2.5 baths. - - - Step into your entry foyer with a convenient half-bath and coat closet. Enjoy your sunlit living room and formal dining room. Your all-new kitchen includes granite counters, stainless appliances, dining space, a laundry closet, and sliding doors to your fenced backyard patio retreat. - - - Walk up your carpeted stairway to three bedrooms and two all-new bathrooms. Relax in your spacious master suite with lighted walk-in closet and private master bath featuring dual sinks and a separate linen closet. - - - Your finished basement offers an oversized family room and two storage rooms with utilities. - - - Two driveways plus on-street spaces make parking a breeze. The large walk-in backyard shed has room for all of your gardening needs. - - - This home has so much to offer, it even comes with a one-year American Home Shield warranty. Make this your new house for the new year!